Before you decide to start a blanket business or wholesale some custom throw blankets (Please link to custom sherpa blankets wholesale), you will want to know the types of the blanket. Today, this post will tell you what is sherpa blanket, and how to take care of sherpa blankets in detail. What is a Sherpa blanket made of? These blankets are made out of artificial material (like polyester, acrylic or cotton) and can also be called faux-sheepskin or faux shearling. There are two different sides in it, one with a smooth knit side and another with a texture created with the intention to copy how a real sheep’s fleece looks and feels. Sherpa fleece can be used for jacket lining, pet beds or throw blankets; they are light, warm, water-resistant, soft and easy to use. Blankets made using Sherpa fabric are called Sherpa blanket or Sherpa fleece blankets. Types of Sherpa blankets are the Sherpa lined blanket, reversible double layer sided blanket, embroidered Sherpa blanket, and other custom-made styles. How to take care of your sherpa blanket or make sherpa blanket soft again? If you can understand why fleece fabric gets rough, you’re on your way to softening it. Fleece is a polyester fabric which is usually made from recycled plastic or petroleum. The difference between fleece and microfleece is simply how tight the fabric weave is and the thickness. Microfleece is thinner and tightly woven than fleece. 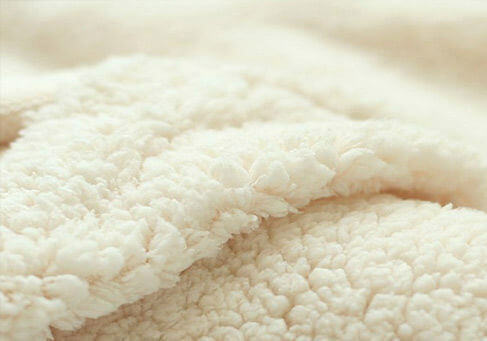 High-quality fleece is fancy and does not pill, unlike low-quality ones, which make them lose their softness easily. Always remember that heat causes danger to the fabric and should be avoided at all costs for the best results. 2. How to wash sherpa blanket? Sherpa fleece blankets need to be washed from time to time thanks to the accumulation of hair, dust, body oils, etc. How do you do it by yourself? Put the blanket in your washing machine alone. This is done to prevent the fibers of your blanket from the pebbling, pilling or shredding that could easily happen if your fabrics rub against everything else that is in the machine. Also, your blanket can pick of fibers from other materials in the machine, and that could cause discolored pilling. It is, therefore, better to separate it from others. Wash in “cold water cycle” and “gentle wash” setting for the delicate blanket. Do not use warm water. Pour a capful of detergent into the water and let it dissolve until it forms suds before putting your blanket into the machine. (Note: It is best if you use a non-detergent soap like Granger’s Performance Wash as detergents can destroy the DWR treatment that makes your Sherpa blanket resistant to water, dirt, pet-hair, and odors. Under no circumstance should you use bleach on your sherpa blanket? Bring out the blanket and hang it to dry or put it in your dryer using a cool tumble dry setting. Tumble dry on the lowest and gentlest cycle possible as high heat can damage your blanket. Whether you want to dry your Sherpa blankets, a sleeping bag or comforter, the best way is to hang the fleece blanket or lie it flat. If there is good weather, hanging it on the line outside will help dry it without pilling, which could happen if you use a dryer. If you want to tumble dry for quicker results, choose the low heat setting. The low-heat setting is the best setting to use if you want the dryer to fluff the blanket up a bit. Constantly check it so that the blanket can be removed as soon as it is dry. When there is an entanglement between tiny balls of lint in the ends of the fleece fibers, it is called pilling. It is caused by friction against linty items like towels, the sides of the washer and dryer and it can build up over time. Pilling can be patiently removed using an electric fabric or sweater shaver. If these gadgets are not within your reach, you can run a disposable razor over the surface of the blanket. Ensure you use light pressure so that you don’t cut or scar the fabric. When you do it carefully, the pills will drop to the table or floor. Wrap wide tape around your hand with the sticky side pointing out and dab it to prevent the pills from reattaching to the sherpa throw blanket. Using these steps, you can remove pills on a large surface after laundry to prevent tiresome work. You should remember a few things during the handling and laundering of sherpa fleece blankets to retain their softness and coziness. Taking care of your sherpa blanket will help it last longer, feel softer and look fluffier for a long time. Dryer sheets Let your blanket go through an extra rinse cycle while reserving fabric softener until the last use. Most importantly, during laundry, remember that heat and friction are the major things to watch against. Also, keep in mind that soap or any other thing that leaves a coating or residue on the fleece fibers without rinsing out completely, or dryer sheets, can leave your blanket feeling sticky or rough.